Upon form submission, a ticket will be created in our support system and we will notify you upon completion. 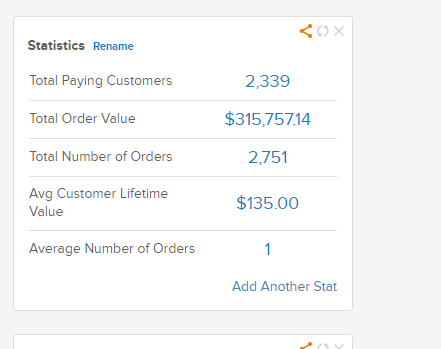 In addition to the , we bring over the top a portion of these stats to your dashboard in Infusionsoft: This is updated every time an order is synced and we will add your historical data to the widget. There’s no limit on the number of order records we can sync into Infusionsoft or the number of contacts. However, if you have more than 10,000 contacts in a dashboard widget it can’t do the math operators on more than 10,000 of them. If there’s more than 10,000 contacts in any widget you can’t do any of the logic operators on their data columns (SUM, average, Min, max); it’ll only count the 1st 10,000 contacts and then ignores the rest. What you can do to get the reporting is to login to your Revenue Conduit admin account and search for this data in your 80/20 analysis tool that we enable because this set of reporting does not have any threshold limitations but may take slight longer to update. To learn more about the stats widget, please see our knowledge base article.